Areas of Environmental Concern (AECs) are the foundation of the Coastal Resources Commission's permitting program for coastal development. An AEC is an area of natural importance: It may be easily destroyed by erosion or flooding; or it may have environmental, social, economic or aesthetic values that make it valuable to our state. AECs cover almost all coastal waters and less than 3 percent of the land in the 20 coastal counties. The following descriptions will help you determine if your project is in an AEC and will help you understand the importance of these natural systems. The estuarine and ocean system is the coast's broad network of brackish sounds, marshes and surrounding shores. Normally found where rivers and streams meet the ocean, an estuary is a unique and important part of coastal life – a transitional area where fresh and salt water mix. From broad, shallow sounds like the Albemarle and Pamlico, to narrow bodies of water such as Core and Masonboro sounds, North Carolina has 2.2 million acres of estuarine waters. Cradled behind the state's long string of barrier islands, these shallow sounds, rivers and creeks make up one of the largest estuarine systems in the United States. Permits may be required for development in four components of this system (see Figure 2.1). all waters in artificially created water bodies where the public has acquired rights by prescription, custom, usage, dedication or any other means. 2. Estuarine Waters are the state's oceans, sounds, tidal rivers and their tributaries, which stretch across coastal North Carolina and link to the other parts of the estuarine system: public trust areas, coastal wetlands and coastal shorelines. For regulatory purposes, the inland, or upstream, boundary of estuarine waters is the same line used to separate the jurisdictions of the Division of Marine Fisheries and the Wildlife Resources Commission. However, many of the fish and shellfish that spend parts of their lives in estuaries move between the "official" estuarine and inland waters. 3. Coastal Shorelines include all lands within 75 feet of the normal high water level of estuarine waters. This definition also includes lands within 30 feet of the normal high water level of public trust waters located inland of the dividing line between coastal fishing waters and inland fishing waters. Along Outstanding Resource Waters, this definition includes lands within 575 feet of the normal high water level. Note: Freshwater swamps and inland, non-tidal wetlands are not in the CAMA permit jurisdiction, unless the CRC specifically designates them as AECs. However, these wetlands are protected by the federal Clean Water Act. An Army Corps of Engineers permit may be required for projects taking place in these wetlands. The lands and waters of the estuarine system are home to fish nursery areas, spawning areas, shellfish beds and other habitats essential to North Carolina's commercial and recreational fishing industries. 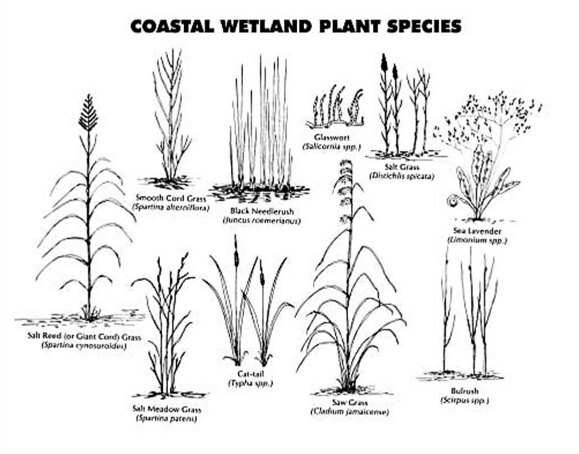 The stems, roots and seeds of many coastal wetland plants provide food and nesting materials for waterfowl and other wildlife. Marsh plants guard against erosion and flood damage: Their leaves and stems dissipate wave energy, and their root systems bind soil. The nutrients and decayed plant material the marsh plants produce also contribute to the productivity of the estuarine system. Estuarine plants trap debris and excess nutrients and help regulate the flow of fresh water into the estuary, maintaining the system's balance. Estuarine shorelines act as natural barriers to erosion and flooding. Certain soil formations and plant communities along estuarine shorelines also help slow erosion. Natural buffers along the shoreline protect the water from excess sediment and pollutants, and they protect nearby developments from flooding and erosion. Estuarine waters and public trust areas are important for tourism, because they support commercial and recreational fishing, boating, swimming and other recreational activities. One of the most notable aspects of North Carolina's coast is the band of narrow barrier islands piecing together the state's eastern border. Many of these islands are home to thriving communities, such as the Outer Banks or the towns of Wrightsville Beach, Carolina Beach and Atlantic Beach. Others, such as Masonboro Island, remain largely untouched by development. All barrier islands change constantly under the forces of wind and water. These forces create a variety of hazards – such as storms, flooding and dune erosion – that can threaten buildings and other structures located there. The Ocean Hazard System is made up of oceanfront lands and the inlets that connect the ocean to the sounds. The Coastal Resources Commission has designated two ocean hazard AECs. 1. The Ocean Erodible AEC covers North Carolina's beaches and any other oceanfront lands that are subject to long-term erosion and significant shoreline changes. The seaward boundary of this AEC is the mean low water line. the distance of erosion expected during a major storm. The width of the AEC varies from about 145 feet to more than 700 feet. The CRC updates long-term erosion rates about every five to 10 years, using aerial photographs to examine shoreline changes. General maps of erosion rates are available free from the Division of Coastal Management; detailed erosion rate maps are available for inspection at all Coastal Management field and local permitting offices. 2. The Inlet Hazard AECcovers the lands next to ocean inlets. Inlet shorelines are especially vulnerable to erosion and flooding and can shift suddenly and dramatically. For each inlet along the coast, the Division of Coastal Management prepares a hazard area map that is reviewed and approved by the Coastal Resources Commission. Each area is mapped based on a statistical analysis of inlet migration, previous inlet locations, narrow or low lands near the inlet, and the influence of man-made features, such as jetties and channelization projects. In each case, the distance the inlet hazard AEC extends inland is estimated to be large enough to encompass those lands where the inlet can be expected to migrate. At a minimum, this distance is the same distance inland as the ocean erodible AEC. Inlet hazard AECs range in width from about 250 feet for a fairly stable inlet to about 4,000 feet for the most dynamic inlets. At the edge of the ocean, ocean hazard AECs get the full force of any storm. Waves, wind and water can quickly change the shape of a shoreline, creating or filling inlets, flattening nearby dunes, eroding beaches and battering nearby structures. No oceanfront development can be absolutely safe from destructive natural forces, but development in ocean hazard areas can be carefully designed and located to minimize the risk to life and property, as well as to reduce the cost of relief aid. Oceanfront beaches and dunes help protect buildings and environments behind them by absorbing the force of wind and waves, while the dense root networks of dune plants trap and anchor sand. Left uncontrolled, development can destroy these dunes and their vegetation, increasing the risk of damage to structures from erosion, flooding and waves. We need fresh water for many aspects of life – drinking, farming, industry – and the protection of these waters is vital to our health and our economy. As rain runs off pavement and rooftops, it carries pollutants and sediments that can put our waters at risk. The CRC has designated two AECs that protect certain coastal public water supplies from the negative effects of development. 1. 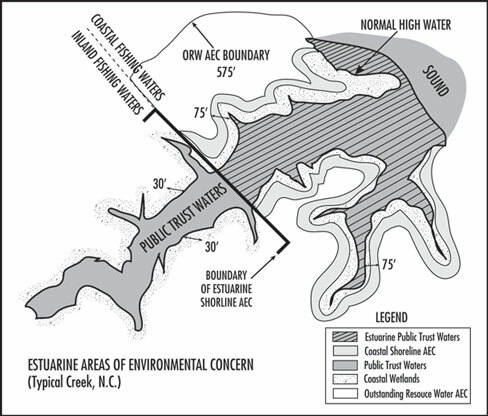 The Small Surface Water Supply Watershed AEC protects coastal drainage basins that contain a public water supply classified as A-II by the N.C. Environmental Management Commission. This classification means that the best use of the water is for public drinking water, and this use must be protected by state regulations. To date, two such watersheds have been designated as AECs: the Fresh Pond at the Nags Head and Kill Devil Hills border; and Toomer's Creek near Wilmington. 2. Public Water Supply Wellfields are areas of rapidly draining sands extending from the earth's surface to a shallow groundwater table that supplies public drinking water. Currently, one wellfield is designated as an AEC, on Hatteras Island at Buxton. Development is rarely proposed in these surface watersheds and wellfields, which are almost entirely in public ownership. But if degraded, these water supplies could threaten public health or force local communities to spend a lot of money to develop alternative water sources. Uncontrolled development within these areas can change runoff patterns or groundwater withdrawal rates, and reduce both the quantity and quality of the raw water supply. Sediment from construction sites and a variety of pollutants from buildings, parking lots and roads also can damage our waters. Natural and cultural resource AECs are specific sites designated to receive protection because they contain environmental or cultural resources that are important to the entire state. They may be important because of their role in maintaining the coastal ecosystem, resources for scientific research and education, historical significance, or aesthetic value. Any person can nominate an area as a natural or cultural resource AEC; the CRC makes the final decision on designation. There are four types of natural and cultural resource AECs. 1. Coastal complex natural areas are lands that support native plants and animal communities, providing habitats essentially unchanged by human activity. These areas are key components of natural biological systems. They provide us with a historical perspective against which to measure the change in coastal habitats; they are a valuable scenic or cultural resource; and they provide an irreplaceable scientific and educational resource. You may be allowed to develop these areas if the development benefits the habitat or enhances the area's biological, scientific or educational values. 2. Coastal areas that sustain remnant species provide habitat for native plant or animal species that the N.C. Wildlife Resources Commission or the federal government has determined to be rare, threatened or endangered. Such areas are necessary for the survival of these species within the coastal region and for maintaining the coast's natural diversity. These areas also provide a valuable educational and scientific resource that cannot be duplicated or replaced. 3. Unique coastal geologic formations are areas containing especially notable examples of geologic formations or processes found in the coastal area. Such formations are important educational, scientific and scenic resources. Jockey's Ridge in Dare County has been designated because of its unique geologic features. embody the distinctive characteristics of a type, period or method of construction. These areas provide unmatched and irreplaceable scientific, educational and aesthetic resources that commemorate the coastal region's heritage. Permuda Island, located in Onslow County, has been protected for its outstanding archeological resources.